There is an excitement about the recovery of wolves in Oregon, much as it was in the early day of Idaho and Montana before local reporters found it easier to write a story about a dead cow than the restoration of our wildlife and wild country. So the wolves move about a lot. 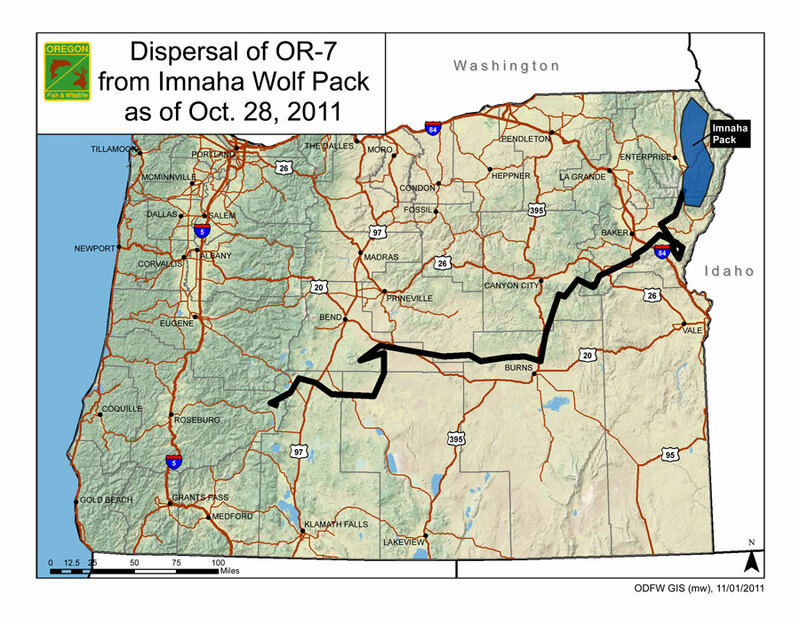 Now famous wolf OR7 who is a 2 ½-year-old gray male that dispersed from the Imnaha pack in September has, as reported earlier, continued to travel SW. The figure below shows his travels from Eastern Oregon into the southern Cascades. Wolf OR3 is another disperser from the Imnaha Pack. He is a 3 ½-year-old black male that showed up in the Ochoco Mountains of north central Oregon. He was last located by USFWS personnel in the Ochoco Mountains on Sept. 30 but was not located in October. He wears a more primitive VHF radio collar. Such wolves on the move are difficult to find. The newly discovered Snake River Pack near the Idaho border probably has 5 members. Only one member of last year’s Wenaha Pack has been seen, but there are probably more. The new Walla Walla Pack has six !! members and ODFW has photos of the family. See the pack (photos). There might be a new wolf pack in what is called the Mt Emily Unit – north of the Umatilla River. ODFW found scats and tracks. These wolves might also be part of the Walla Walla Pack. Controversy and legal action continues to swirl around the Imnaha Pack, but they are protected for now by a count stay. Regardless of what happens to them, the pack gave Oregon wolf recovery a huge lift. Folks should remember that. Oregon Court Extends Ban on Killing Oregon’s Endangered Wolves. State’s First Wolf Pack in 65 Years Out of Crosshairs — for Now. By Oregon Wild. Oregon wolf conservationists (Cascadia Wildlands, the Center for Biological Diversity and Oregon Wild) continue to have success keeping the state wildlife agency from killing the last two members of the Imnaha Pack. Of course, now it has been so long since the original kill order for the last two wolves was issued, that killing them would be pointless. It probably won’t be long before we hear reports in the very SE corner of Oregon also. I was deer hunting in the Owyhee Mtns last weekend and talked to a group of hunters who reported counting atleast six wolves in the Upper Reynolds Creek / Silver City road area. This is not far from the Oregon Border. I spoke with a IDFG Biologist in the area and he was aware of atleast two Black Wolves in the South Mountain area of the Owyhees. Glad to hear the wolves are expanding and their population seems to be greater than expected. OR-7 was reported north of Upper Klamath Lake yesterday. Wow! That is awfully close to California and the Modoc National Forest. Go wolf, go. I can’t wait until they spread all through Oregon and Washington. It will be just like Yellowstone. In 1994, the year before wolves were reintroduced, there were 19,045 elk in the Northern Yellowstone heard. The 2011 post season count was 4,635. This should be exciting. I will be interesting to see if any part of your simple extrapolation from one set of data proves to be true. “Sorry economic condition” of Wallowa County folk ?? Ralph, you are a sorry excuse of one who claims to teach. You don’t live in the county you are blabbing about. ( your writing is actually LOWER than ‘blabbing’) And excuse us if we don’t like the feeling of having something shoved down our throats and thinly veiled as “good for us”. You are laughable and worth LESS time than you were given here. You don’t seem to have many facts in your comment. We don’t have to live in the county to write about it. We understand that cattle interests are doing better in general than other folks. We also know that political power and economic rewards are distributed quite unevenly in most rural counties. Folks in some places seem to be waking up to the trick of crying “wolf,” while the top 1% makes off with the goods. You and your kind are the worst kind of hypocrites. You’d willingly shove anything down someone else’s throat as long as you felt it was in line with your own values, however judgemental and wretched they may be. How is it they never write of places that have as many wolves as Yellowstone’s northern range with a stable or growing elk population? To these people, the Jackson Hole Elk herd doesn’t seem to exist, except, of course, a sub-unit of it where the population of elk is down — Gros Ventre. Here is their logic. Lots of wolves, elk declining. Wolves are to blame. Lots of wolves, elk stable or increasing. No mention of wolves. Just a few wolves, elk declining. Wolves are to blame. Thank you Ralph for that very detailed update on Oregon’s wolves. It’s good to see them dispersing out of the “kill zone” of Eastern Oregon. Go Wolf Or-7 and Wolf Or-3..don’t look back. It reminds me so much of the joy we all felt in the late nineties and early 2000’s when Montana and Idaho wolves were making history. Those days are sadly behind us. Looking at the travel map, it’s amazing to me that wolf crossed the Oregon desert. I’ve been across it a few times and it’s easily one of the most remote places in the lower 48. There is nothing out there. Hundreds of miles of lonely, open country for an animal to cross. Oh the elk whiners here in Jackson flowed a few tears and tried to be disruptive during Carter’s presentation the other night, but I for one, asked them to be still and let the person who we all came to see, speak! They were riled up about the slide showing that RMEF report a year or so ago, showing healthy elk herds all over the place. No one in room had any sympathy. Cindy, what did the anti-wolfers there last night say to Carter? Were there more pro=wolf people there than anti-wolf? Ok. There is a Nov. 15 update to the story “News about Oregon Wolves.” It is good news. I am an Oregon cattle rancher’s daughter and I am still ranching today. I designed License To Protect with all Oregonians in mind. License To Protect would create a new employer for Oregon Department Of Fish & Wildlife (ODFW) by way of the non-hunting Oregonian (or any Oregonian) buying a nonlethal license for cougar or wolves at the same cost as a killing license; thus reducing the numbers of wolves and cougar killed. ODFW, The Federal Government Wildlife Agency, Oregon’s Agriculture Department and any other agency involved with the killing of cougar and wolves; would be required to hold to the letter of the law License To Protect and not increase kill quotas in other Bills or policies in order to offset the number of cougar and wolves saved from death that LTP would achieve. Currently, there are more cougar and wolf killing Bills, policies, and programs from the above organizations that were established without an environmental impact risk factor study done or unbiased outside peer review performed, before thrusting them upon Oregon ecosystems and wildlife. These various Bills and programs from these departments have insured that there is no true protection for either cougar or wolves at this time. There are only 13 States left with cougar, fewer with wolves. Here in Oregon we have far less cougar than we are told, and even less wolves. ALL funding from License To Protect would be strictly monitored. The funds from this Bill would then be used to provide open wildlife corridors, non-lethal livestock protection programs, wildlife public safety education, compensate livestock owners any documented loss from cougar or wolves, develop eco-business, and as proven in other State’s small rural towns that have wolves; would encourage a larger year-round income from tourist predator wildlife watching than hunting them ever brought in. As well as the tourist income this Bill would encourage, the statistics show there are currently more non-hunting Oregonians (approx 380,000,000) and more wildlife watchers ( 1.7 million) than there are hunters (282,000), so the funds used in License To Protect life giving programs could be substantial. The logistics of presenting License To Protect to the public can be as simple as a check box on their tax documents – right next to the wildlife funds that ultimately support hunting. Cougar and wolves would not only be the keystone species for better wildlife, but also a keystone bridging the gap between rural needs and urban understanding of them. Please visit our petition site for License To Protect and sign! Visit http://www.OreCat.org to learn more about the background of License To Protect. All good solid ideas. Progressive states like Oregon make these reforms possible…..Idaho, Wyoming–not so much. Giving everyone a stake at the table on how wildlife is managed…..a novel idea. What kind of feedback are you getting from the Fish and Game and from the hunting community?